What prizes fit under your me wee tree? Multiple Contests, Multiple Ways to Win! 1. Download the app for your iphone or android. 2. Grow, love, feed and water your tree EVERYDAY. 3. When you get enough points you can start to decorate your tree. 4. Upload your awesome tree to our facebook page and encourage your friends and family to ‘like’ your tree. Every ‘like’ counts as a vote and the tree with the most votes will take home our awesome grand prize! Included in this grand prize…a new ipod touch! 5. Voting will be closed on December 15th and the most likes wins!! We will ensure we get this prize to you in time to get it under your wee tree! 2. Review the wicked app and ensure you include ‘wean green’ somewhere in your review. 3. Every Friday we will randomly draw a name from the ‘wean green’ reviewers and they will win. Super easy! You may even take home an ipod shuffle for under your tree! 12 Days of Prizes, Chance to win a ModMom Toy Box, Bugaboo Stroller and Wishbone Bike! 1. Check out Babybot’s rules and instructions on how you can take home the goods this Christmas! Wouldn’t it be great to throw a Mod Mom Toy Box filled with some of the best modern kids products from top companies like Boon, Skip Hop and of course Wean Green?!! 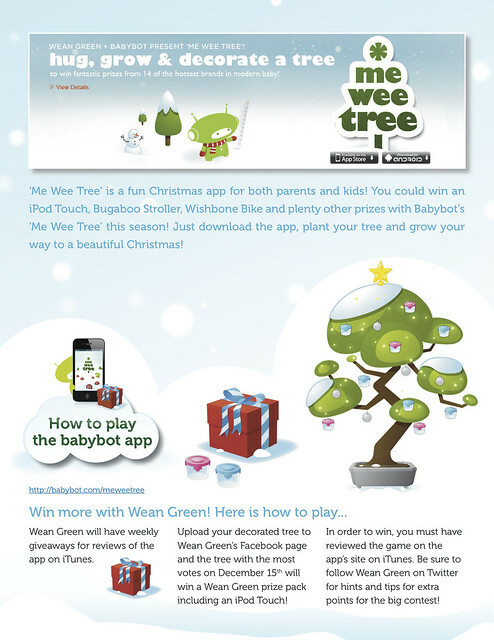 **HOW TO GET YOUR ME WEE TREE OFF YOUR PHONE AND ONTO OUR FACEBOOK TO WIN! In order to take a screen capture of the iPhone or iPod, press and hold the Home button that is located at the bottom center of the iPhone and is more often used to return to the default screen of your iPhone. You can then either upload the photo straight from your phone onto our page OR you can email it to yourself and do it when you get back to the big screen! This entry was written by Melissa, posted on November 23, 2011 at 3:16 am, filed under Wean Green Contests and tagged Baby Prizes, Babybot App, Bugaboo Stroller, giveaways, Holiday Apps, Mod Mom Furniture, wishbone bike. Bookmark the permalink. Follow any comments here with the RSS feed for this post. Comments are closed, but you can leave a trackback: Trackback URL.